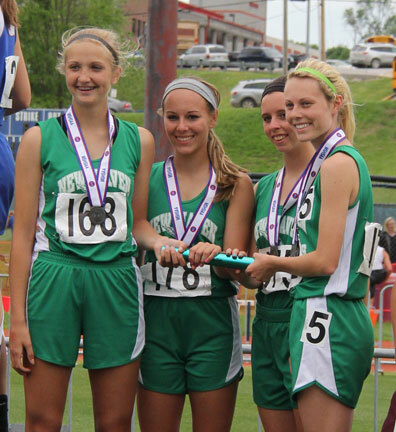 Pictured: New Haven Girls Track Team 4th Place Finish in Missouri Class 1 State Track. JEFFERSON CITY, Mo. - For a high school without an actual track, instead they practice on one made out of gravel, this has not stopped New Haven’s Track Team from becoming the most successful sport in Shamrock history, particularly in terms of State Champions. 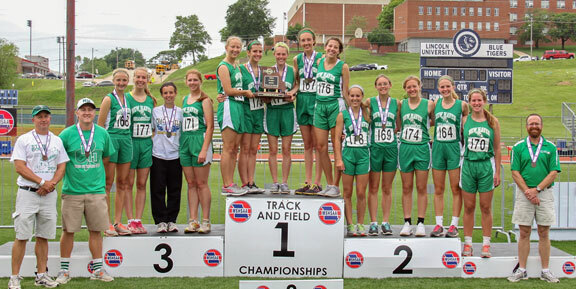 At this past weekends Missouri Class 1 State Track Meet (May 22-23) the New Haven Girls Track Team added to the collection of State Trophies by walking away with a 4th Place State finish. Saturday marked the end of an amazing journey for a group of gift and extraordinary senior’s Shamrock careers. 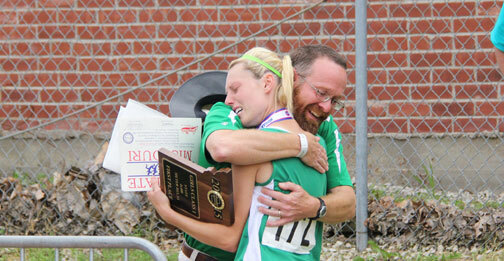 They began their freshman careers known as the “Freshman Flash” and departed as State Champions. 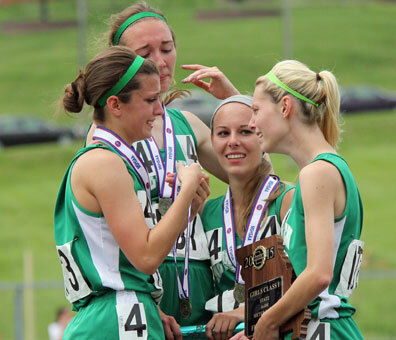 It could not have been more fitting that three seniors, Molly Munsinger, Taylor Covington, and Hannah Pruessner, who have spent the past four years running in the final race, 4x400 relay, of the State Meet to be the ones who sealed their team a Missouri Class 1 State 4th place finish, a much deserved ending to their careers. Heading into this year’s State Track meet Coach John Tucker said that placing in the top four would be difficult but a possibility. However, following Friday’s prelims Coach Tucker was optimistic about Saturday. Freshman Emma Engelbrecht takes 5th place in the triple jump. “I felt we really had a chance to finish as a team in the top four… Friday we ran really well, most all of our relay teams and individual races ran personal best times” said, Tucker. However throughout the course on Saturday he was unsure if they would have a chance at a winning a final four trophy until the 4x400 meter relay. Senior Beth Schenck places 8th in the high jump. But in a gutsy decision that Coach Tucker made prior to getting off the bus Saturday proved to be a brilliant one. 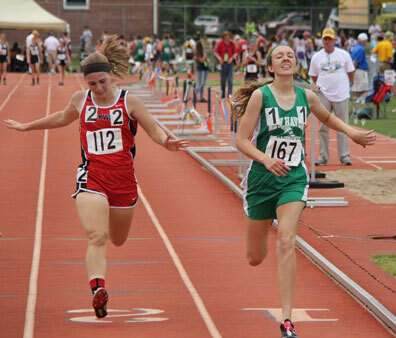 The decision Tucker made was to move Taylor Covington, who had always ran the last leg in the 4x400, to have her run the second leg and have Molly Munsinger be the anchor. “You never want to move runners around on your relay teams but with Taylor running the 400 meter dash at 1:05 then turning around and running 800 meter at 1:45 before finally running the 4x400 at 2:45” Tucker, explained. Munsinger just exploded in the final lap, running a split of 1:01.78 as New Haven won by three seconds, which is a good margin of victory, picking up their second straight 4x400 relay State Championship. While the 4x400 relay team gave New Haven the final points they needed, it was New Haven’s other relay teams and those in individual events that put their team in position and control of their own destiny. 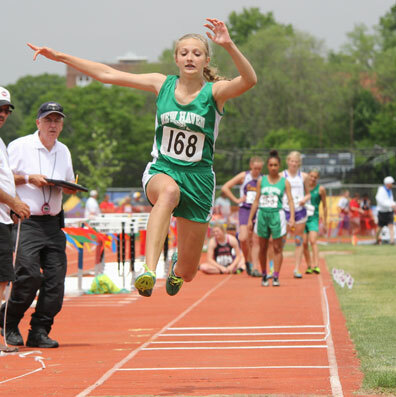 In the past New Haven has struggled in the field events, never being able to squeeze out a few extra points they’ve always seemed to need, except for this year. Only two points separated New Haven and the fifth place team (Orrick). 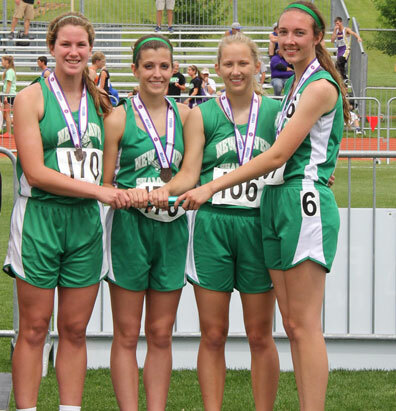 Pictured is the 6th Place All-State 4x800 meter relay team: Lauren Gerlemenn, Hannah Pruessner, Kayla Borcherding, and Taylor Covington. 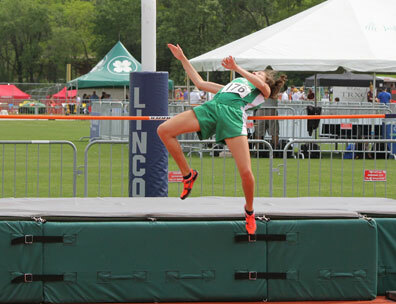 Athletes such as Beth Schenck’s 8th place finish in the high jump gave New Haven one point and freshman Emma Engelbrecht’s 5th place finish in the triple, adding four more points would proved key in the Shamrocks final four finish. Then there is senior Taylor Covington’s gutsy performances in both days, qualifying in four events, two relay teams (4x400 and 4x800) and the open 400 and 800. Covington was faced with an extreme amount of adversity. 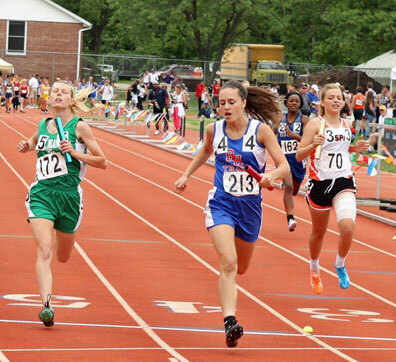 Competing in three races in one day is not uncommon but with only 40 minutes between the 400 meter and 800 meter run, then having less than an hour to recover before the 4x400 meter relay, is not as common. 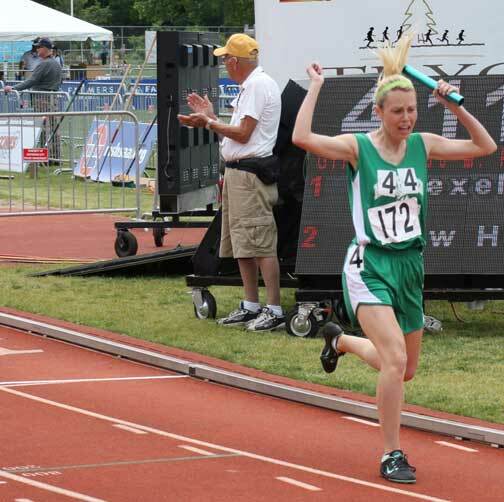 Remember the advice Coach Tucker has always given her, “Run with your heart and your legs will follow” helped her overcome the pain in her legs to finish 7th in both the 400 meter dash and 800 meter run before running her fastest ever 4x400 meter split. New Haven has consistently been strong in the relay events, especially this year, with all four relays finishing in the top eight, adding more points to their overall team score. In the first and only relay finals on Friday, the 4x800 team pulled off a 6th place finish thanks to a fearless performance by Covington. 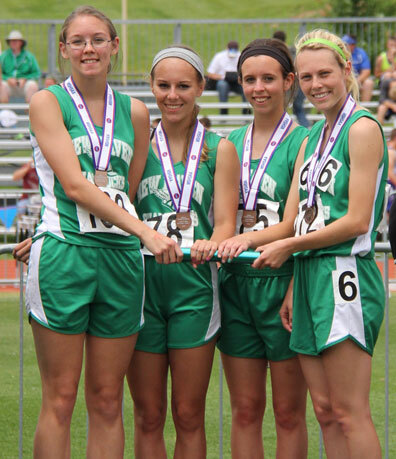 Pictured is the 5th place All-State 4x100 relay team: Hanna Fitts, Nichole Zeitzmann, Stephanie Russo, and Molly Munsinger. Running the final leg or the teams anchor, Covington began the final leg with her team in 9th place, passing three girls in the final lap and giving New Haven a 6th place finish. Along with Covington, Molly Munsinger has been New Haven’s other senior and between the two, they’ve been the backbone and leaders of their team. After breaking the school record on Friday with at time of 52.72 and qualifying for the finals on Saturday, the 4x100 took 5th place thanks in part to Munsinger’s final surge, holding onto 5th by just .13 seconds. Then it was the 4x200 relay team’s impressive second place finish with at time of 1:49.78 (just .17 second difference from first place) which at the time began making a fourth place team state finish a possibility. Pictured is the 2nd Place All-State 4x200 relay team: Emma Engelbrecht, Nichole Zeitzmann, Stephanie Russo, and Molly Munsinger. While New Haven loses the core of this year’s team, another set of talented sophomores and juniors that Coach Tucker is confident will follow in this team’s footsteps. One thing to note about Coach Tucker and based upon our research, is the only coach in the history of New Haven High School to win two team state trophies in the same school after he lead the boys cross country team this past fall to a fourth place state finish. 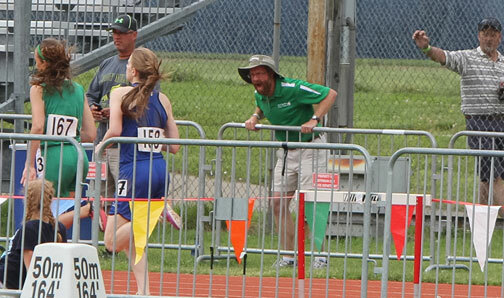 Pictured: Coach John Tucker on the back stretch, where you will find him at every track meet. Here are a few special moments. Like Us on Facebook page to see more amazing moments caught on film.